Cameras are powered by several different supplies. The standard power system is a 110 vac PoE Injector which combines the Ethernet signal with power to operate the camera. 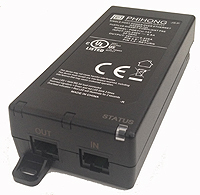 The camera can also be powered from 12 vdc, 24 vdc or 48 vdc power supplies or battery banks. Designed for remote locations with or without wireless access, the SRP-P40 uses high-efficiency Allkaline batteries for longer life and less weight. Providing more power in a smaller package and half the weight of standard rechargeable lead batteries, the power pack is ideal for shipping or hand-carrying into remote locations. 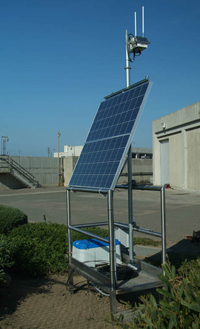 Designed for remote locations with or without wireless access, solar power systems are custom built to supply sufficient power for cameras, lighting and wireless transmitters.